Patients wanting to be opiate free reach out to us. We detox all opiates, including Oxymorphone, rather than substituting one opiate with another opiate. Rapid Oxymorphone Detox under sedation is a medical detoxification treatment offered by All Opiates Detox for patients dependent on the opiates. Rapid opiate detox consists of sedating the patient and removing Opiates from the brain receptor while the patient is sleeping. Acute withdrawals are precipitated with an opiate blocker. These withdrawals will pass during the sedation period. Once the withdrawals are over, and the brain receptors are free of the opiate, a blocker is placed to prevent any opiates from getting back into the brain receptor. Oxymorphone (Trade name Opana) is an opiate that was used to treat moderate to severe pain. Opana was taken off the market and is no longer available as of July 2017 since it was highly abused and misused. The reformulation in 2012 led to a shift in the route of abuse from nasal to injection. It was available in IR (immediate release for as-needed dosing for pain) and ER (extended release for around the clock dosing). Oxymorphone typically started working in 20-40 minutes, with maximum effect at about two hours and duration of action lasted four to six hours. The extended-release, Oxymorphone ER, started working 60-90 minutes after administration. The total period of the ER, extended release, lasted about twelve hours. Oxymorphone was classified as a Schedule II controlled substance due to its capacity for dependence, abuse, and misuse. Common side effects include constipation, drowsiness, dry mouth, nausea, vomiting, lightheadedness, and drowsiness. Serious side effects may include difficulty breathing and respiratory depression. Physical symptoms of Oxymorphone withdrawal include diarrhea, headaches, insomnia, muscle aches, nausea, restless legs, sweating, and vomiting. Symptoms of overdose include mental status changes such as fatigue, drowsiness, and confusion, apnea, slow heart rate, cold and clammy skin, respiratory depression, bluish fingertips and lips, unresponsiveness, sleepiness leading to coma, cardiac arrest or death. 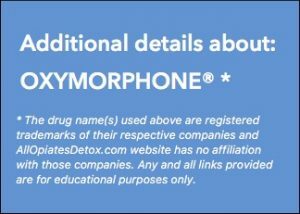 Oxymorphone was taken off the market in July 2017 due to its highly abused and misused capabilities. Oxymorphone was abused nasally and then abused by injection following the reformulation in 2012. It was the first time in US history that the FDA requested an opiate be taken off the market due to abuse. Improper use and abuse of Oxymorphone by many led to dependence, tolerance, and addiction. Oxymorphone was habit-forming, causing not only physical but also psychological dependence. Withdrawals would occur if the dose of the Oxymorphone was reduced or discontinued after long-term use. Using opiates for an extended period can lead to tolerance, where the user needs to increase the dosage of their drugs to achieve the desired effect, whether the desired result is pain control or euphoria. Once the patient developed a tolerance, it became even more difficult to stop using Oxymorphone due to the withdrawals. Symptoms of withdrawals were an indication of physical dependence and addiction to the Oxymorphone. Most patients described withdrawals as the worst, most frightening experience one will ever encounter. One can only imagine the excruciating pain when the opiate user says that they’d rather die than go through the withdrawals. Oxymorphone physical dependence symptoms, such as withdrawals, led to psychological dependence. Improper use and abuse of Oxymorphone can lead to dependence, tolerance, and addiction. Once the patient develops a tolerance, it becomes even more difficult to stop using due to the withdrawals. Symptoms of withdrawals are an indication of physical dependence and addiction to the opiate Oxymorphone. Most patients describe withdrawals as the worst, most frightening experience one will ever encounter. One can only imagine the excruciating pain when the opiate user says that they’d rather die than go through the withdrawals. Oxymorphone physical dependence symptoms, such as withdrawals, lead to psychological dependence. That is when addiction takes over the mind and life of the Oxymorphone opiate user.